Here's a few tips on caring for your Laminate floors to keep them beautiful. They need to be cleaned regularly in order to keep them from getting scratched or warped. 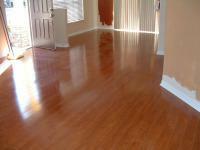 Using harsh chemicals can create streaks or damage laminate. Dust mop your floors on a regular basis. For a deep cleaning use water and mild cleaners. Laminate tends to be scratch resistant but excess dirt, hair, and debris can cause scratching if allowed to build up over time. Besides a dust mop. you can use a vacuum with a soft brush attachment. Never use stiff, straw like bristles because they could cause damage.